DISCLAIMER: This recipe may be considered by some to be "healthy". If your system is used to butter, cream, and red meat you may experience signs of fatigue and irritability. This is a great recipe to make in bulk. The wraps freeze very well, and one can be thrown into your lunchbox before you leave for work and by the time lunch rolls around its just perfect. The night before take your chicken breasts and place them in a large zip-lock bag to thaw. Add two shots of tequila, the entire beer, and dashes of Rosemary, Thyme, Salt, and Pepper. Seal the bag and shake it around. This is my TOP SECRET Tequila marinade. Tell No One! As always, lets begin by washing our hands and taking a shot of rum... Don't want to get your bottle or shot glass dirty. 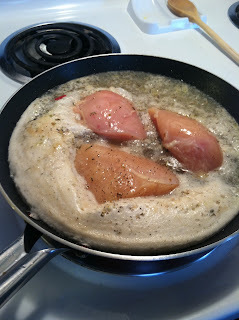 Heat a large frying pan and add the chicken and all of the marinade. Cook on medium-high heat, turning the chicken occasionally until cooked all the way through. If your chicken was still partially frozen when you started you may have to remove the chicken from the pan and cut it into smaller pieces to continue cooking. Some of you may be skeptical about using beer as a cooking medium, but let me assure you there's nothing better for pan cooking chicken, pork-chops, or steak. Try it. If you're squeamish about wasting a perfectly good beer, try the "one for me, one for you strategy", which involves taking a drink for every pour you add to the pan. It wastes the same amount of beer, but you get to drink some as well. While the chicken cooks, dice up your tomatoes and set aside in a bowl for later. In a separate bowl, add a healthy dollop of sour cream. Mix in generous portions of the Greek Seasoning, Famous Dave's Seasoning, and Garlic Powder until a uniform texture is achieved. 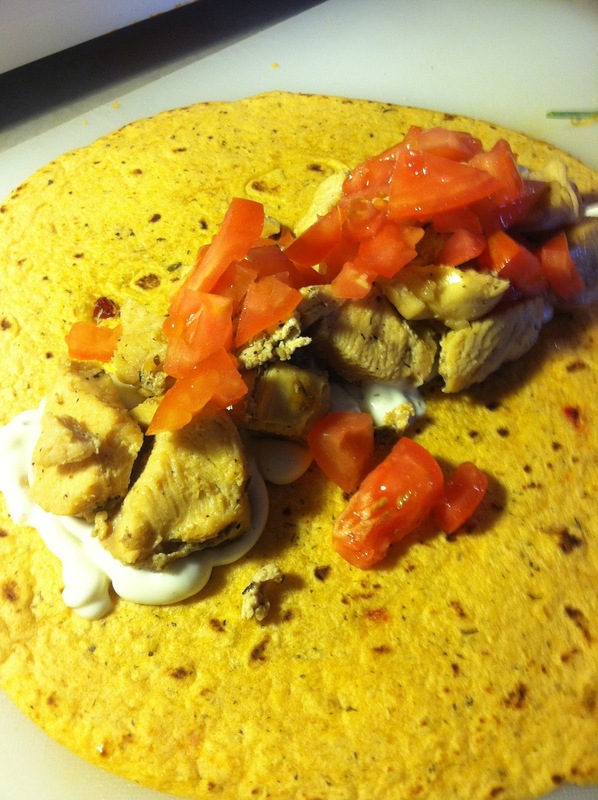 Once the chicken is done, drain any excess marinade and place on dry paper towels to absorb any residual grease. If you haven't cut it up, cut it up. Now its time to begin assembling our wrap. 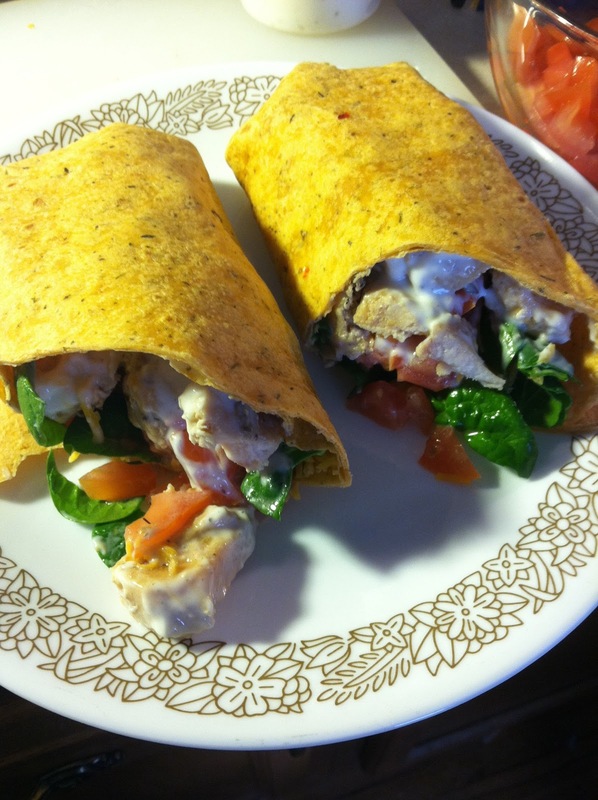 Begin with a wrap tortilla. These are specially made to wrap easier without tearing, however a regular tortilla will work just fine as long as you pre-warm if first. 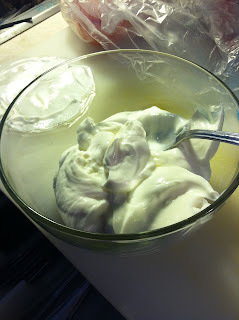 Add a generous amount of the sour cream mixture, followed by a handful of the chicken pieces. Next add a layer of diced tomato and spinach leaves. Finally dust with a fine coating of shredded cheddar cheese and wrap up. Cut diagonally along the center and serve. Enjoy it, your arteries will thank you by letting blood get to your brain, possibly preventing heart disease or stroke. Lunchtime: The most important meal of the day.